Leprechaun's Luck is a 5-reel 20-line slot game based on an Irish theme. The game features a Progressive Jackpot which can be won from two separate bonus rounds: The first is a wishing well bonus round and the second is a rainbow bonus round. The game also features freespins with extra locked wild symbols. The game consists of 5 reels, spinning to a stop with the winning outcome derived from a combination of symbols across the 5 reels. The game is fixed at 20 win lines but the player can choose their total stake from £0.20 up to £200 (exact stakes and maximum stake can be adjusted by server). The reel symbols are based on an Irish theme (as well as 10, J, Q, K and A symbols). Line wins are awarded when the same symbols appear adjacently on a selected win-line, starting from the left reel (the number of adjacent symbols needed is shown in the paytable). All in-line wins are calculated by multiplying by the stake placed by the player on the win-line by the multiplier value of the matching symbols. There is also a Wild symbol which can substitute for other symbols to help create a line win (or can be a win on its own if 2 or more of them are next to each other on an active win line). If more than one win can be awarded on the same line (for example 3 wilds in a row or those wilds counting as a different symbol to make 4 symbols in a row) then only the highest paying win will be counted. If the payouts are the same then the Wild win will be awarded. Using a wild symbol to complete a line does not incur any extra multiplier other than the win for the symbol(s) it is used to substitute. The player can also get a win (access to a bonus round) if they have 3 or more of the same scatter symbol anywhere on the reels. The reels are designed so that it is possible to get the freespins (Leprechaun) and one of the other two types of bonus in one go, but they can not get both the wishing well and the Rainbow bonus in the same spin. If the player does get the freespins and one of the other bonuses in the same spin then the bonus will play out first and then the freespins will start. Scatter wins are calculated by multiplying the total stake placed by the player by the multiplier value won in the scatter. 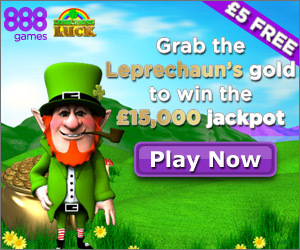 If the player gets 3 of the Leprechaun scatter symbols anywhere on the reels then it will trigger the Free spins Bonus. These symbols only appear on 3 of the reels and so it is not possible for the player to get more than 3 of these symbols. An animated Leprechaun will appear in the foreground (in front of the reels) from the side of the screen. He’ll puff on his pipe to reveal numbers in the smoke; these numbers will be between 1 and 12 and represent the number of freespins to add. The maximum total number of freespins that can be awarded is 20. The Leprechaun will then put his pipe away and then proceed to jump randomly across the reels; each symbol he lands on will change to reveal a wild (1-5 peel off wilds). These wilds will remain in place in front of the reels for all the free-spins and be used instead of whatever symbol would be in that position on the reels, and so increase the chance of getting wins. Note: while in freespins the reel bandings used are not the same as those in normal play- There are no scatter symbols or wild symbol and so the bonus rounds (and extra freespins) cannot be triggered. The win amounts while in free spins are all the same as in normal play (wins are not doubled or anything). • Select your stake by clicking on the arrow buttons. • Click on TURBO if you want the symbols to be displayed immediately without having to view the scratch animation. • Click on the panels to reveal the hidden symbols. To reveal all the panels at once, click on REVEAL ALL. Do you have the luck of the Irish? Find out by playing this charming scratch card with an Emerald Isle theme! Match 3 lucky Irish symbols and win big cash prizes, up to 500 times your stake. • Select your stake by clicking on the arrow buttons in the ‘Stake’ field. • The higher your stake, the higher your winnings – up to 500 times your stake! • Click on the TURBO button if you want the symbols to be displayed immediately without having to view the scratch animation. • Click the PLAY button. • Click on the panels to reveal the hidden symbols. To reveal all the panels at once, click on the REVEAL ALL button. • If you reveal 3 matching symbols you win. There is only 1 win per card. As soon as 3 matching symbols appear, the remaining panels will automatically be revealed and the game ends. • The prize multipliers are displayed on the left side of the scratch card. Autoplay: Click on AUTOPLAY for the game to be played for you. Next, click on the number of games you wish to autoplay. You can autoplay 5, 10, 15, 20 or 25 games.